Lake Tekapo marks the beginning of a long stretch of lake hopping from Tekapo to Lake Pukaki, then Lakes Ohau, Wanaka, Hawea, and finally Lake Wakatipu in Queenstown. All of these lakes are massive, gorgeously blue alpine beauties set below the Southern Alps. The first leg of this journey, from Tekapo to Twizel, follows a gravel cycle trail along a series of canals. It's flat, exposed, and though there are stunning views, they don't change much for about 35 miles. To liven up the flats, we opted for two wheels instead of two feet. 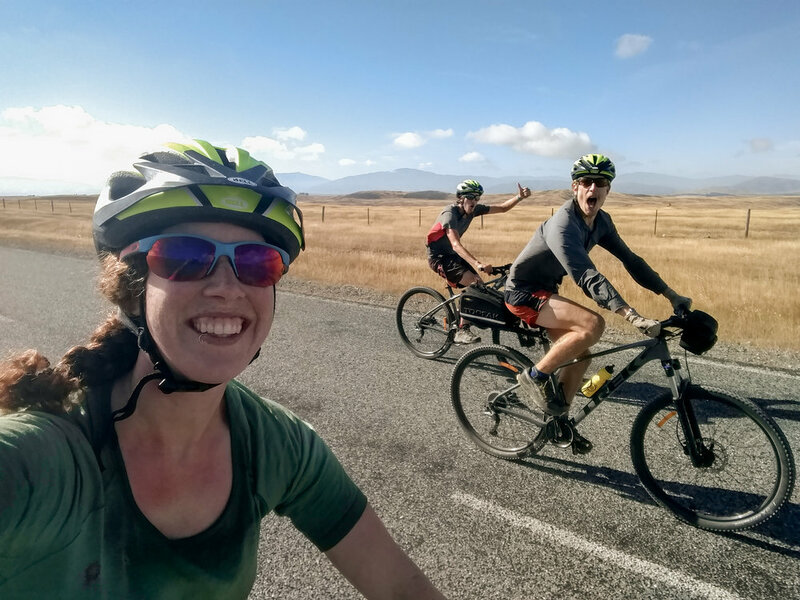 Our bikes arrived at 8:30am and we rode off feeling gleefully free of our packs, which were being shuttled directly to Twizel. 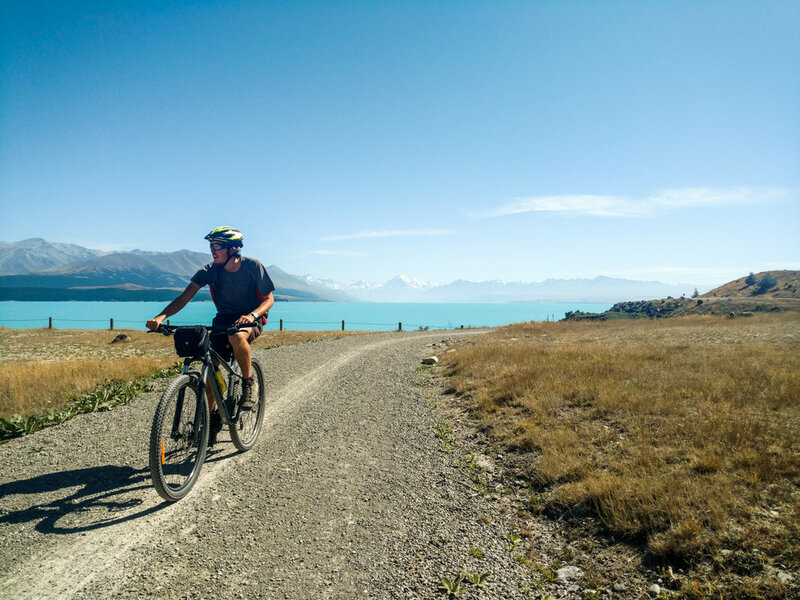 About halfway through our ride, we soared down a long, smooth descent toward the stunning Lake Pukaki and joined a gravel cycle trail along the lakeshore. The glaciers of Mount Cook National Park beckoned in the background. Of course, we couldn't resist a quick stop at the Salmon Shop at the south end of Lake Pukaki, which offers up local New Zealand king salmon sashimi. A note for hikers/travelers interested in doing this ride: We used BeSpoke Bike Tours, which I can highly recommend. It ran us $65 NZD per person with a group of 3+ and the super friendly owner, Annie, shuttled our packs to Twizel and met us at the end. The bikes arrived with full water bottles and small packs where we could store sunscreen and a few snacks for the ride. The trail is mainly gravel with a bit of paved road and is suitable for anyone relatively fit, even with no mountain biking experience at all. The next two days were filled with big climbs and beautiful views. After walking around Lake Ohau, we headed up through blissfully shady beech forest to an unnamed pass where, miles and miles from any town, we found a small spring gushing out of the mountainside. Someone had planted a pole next to it with two small hooks holding little copper mugs for passing trampers to sample some pure NZ spring water. There wasn't a sign and it would have been easy to miss, but the little act of camaraderie made me smile. Of course, we stopped for a sip. Charlie takes in the view on the climp to Martha saddle. We had two more substantial climbs to surmount before Lake Hawea and they couldn't have been more different. The steady grind to Martha Saddle was tussocky with jagged ridges rising towering above a wide, rocky 4WD track. But the climb to Breast Hill was steep and scrappy; we hauled ourselves up steep walls of soil on roots and trees, kicking steps into the dirt. Just as we reached the summit of Breast Hill, the clouds began to thin and we glimpsed a fleeting view of the lake before descending the wild, jagged ridgeline toward the water. We'd been wondering where all of New Zealand's switchbacks had been hiding, but as we zig-zagged down interminable 100-foot-long runways, we wondered no longer. Descending the steep ridges off of Breast Hill. From Lake Hawea, the trail follows roads and bike trails leading directly into Wanaka. Wanaka is a small ski town that has grown substantially in recent years, but retains a core of van dwellers and adventurous types who staff the many cafes, gear shops, and kayak rental kiosks along the beach. It sits in a little cove at the southern end of another perfect mountain lake. We stayed at a cozy "backpackers" (hostel) with a communal kitchen that was constantly filled with people chattering in French, Dutch, and German. It had a big grassy yard with picnic tables and laundry drying on the lines. 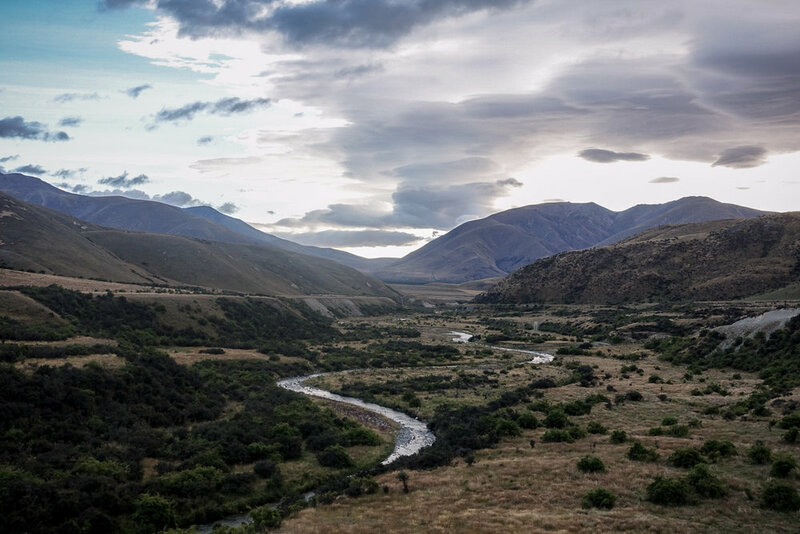 For hikers: This is a must-stay hostel -- definitely our favorite one in New Zealand -- but you may need to book ahead from Twizel or Lake Hawea. Check it out here. Wanaka would be our first zero day on the South Island and it truly was everything we dreamed it could be. The day started out with a jog along the beach to visit #thatwanakatree at dawn. Don't let the tranquil image fool you; this little tree is an international Instagram star. 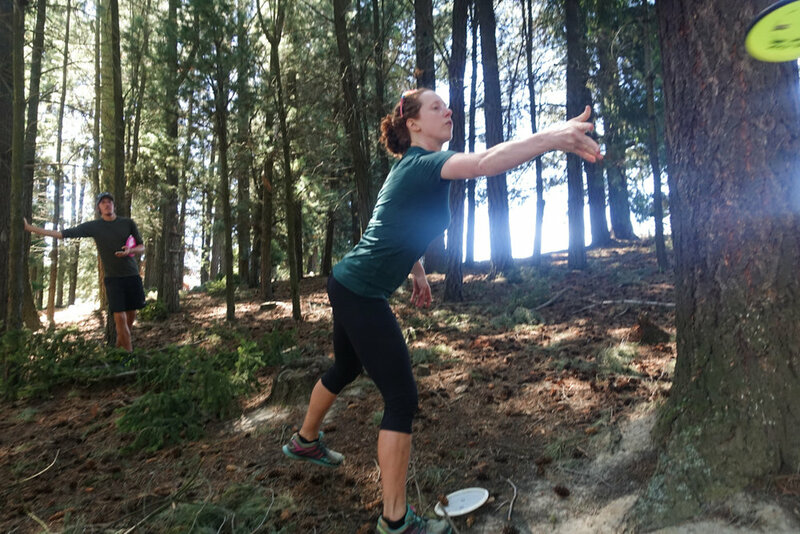 After breakfast, Jonathan, Charlie, and I rented a set of frisbee golf discs, grabbed a six pack, and headed up to the local course. Charlie and I still managed to enjoy ourselves while getting thoroughly trounced, then Jonathan led us all back to town for victory burritos. Mexican food is (very) rare here and since Kiwis think black pepper is too spicy, decent burritos are pretty much impossible to find. Burrito Craft did not disappoint. Two Americans were working at the counter and the spice scale ranged from 0-10 with severe warnings on everything above a 5. For dinner that evening, we hit up a trendy spot on the waterfront that was so jam-packed that the three of us (as the hikertrash that we are) just decided to take our plates outside and sit on the sidewalk, rather than waiting for a table or standing awkwardly in the corner. We got a good laugh as an older woman, clearly a tourist from China, stopped to openly take a photo of us sitting cross-legged with our plates in our laps. It made us feel a bit like zoo animals, but at the end of the day, my only regret is that I didn't have the presence of mind to whip out my phone and snap a shot of her, as well. Of all of the towns we visited along the trail, none quite captured our hearts as much as Wanaka. It was hard to leave the next morning, though we softened the blow a bit with a third (yea... third) round of the locally made Black Peak Gelato. Kiwis have a weird obsession with "Hokey Pokey" ice cream (vanilla ice cream with chunks of honey comb), but my favorite unique local flavor was definitely the feijoa sorbet. Feijoa is apparently called pineapple guava in the states, though I'd never heard of it before coming here. To me, it tastes a like a delicious tropical version of a granny smith apple mixed with pineapple and papaya. Blackpeak Gelato has a very special place in our hearts. We walked out of town, ice cream cones in hand, and strolled along the lakeshore admiring the massive peaks of Mt. Aspiring National Park in the distance.